Get maximum, targeted protection in the sun with the Vichy Ideal Soleil Stick SPF50+, a handy formula for over-exposed zones or sensitive areas. Formulated with the patented Vichy UV filter Mexoryl XL, it offers broad-spectrum protection from both UVA + UVB rays, while also helping to prevent the appearance of brown spots and premature skin ageing. Soothing Vichy Thermal Spa Water keeps skin soothed, calm and hydrated. Smooth the Vichy Capital Soleil Stick onto skin directly from the stick. Reapply frequently. Perfect for over-exposed areas such as the nose, the ears and the forehead. Hypoallergenic. Non-comedogenic. Preservative-free. Targeted protection, easy application. Anti-drying formula. 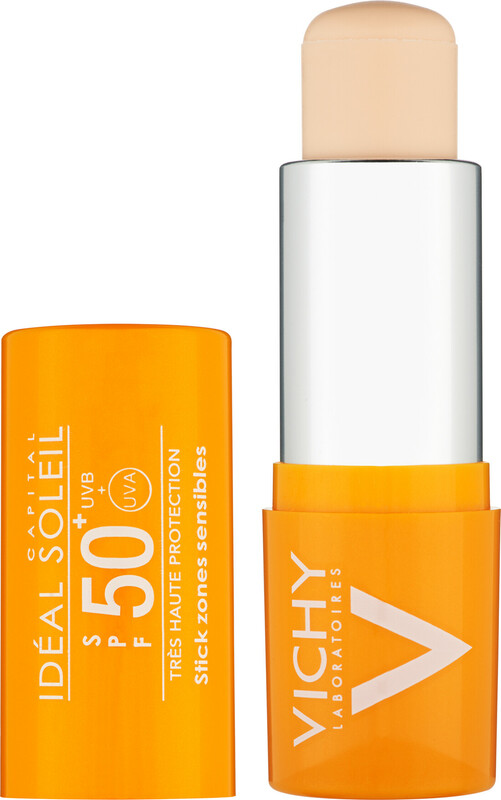 Vichy Ideal Soleil Sensitive Zones Stick SPF50+ 9g is rated 5.0 out of 5 by 7. Rated 5 out of 5 by Titianred from Fantastic product I have recently been diagnosed with a seborrhaic keratosis (the endless joys of getting older) and wanted some high factor sun protection that could be applied to very specific areas and not take up too much space in my handbag. This really fits the bill. Rated 5 out of 5 by Jujuvegan from Practical It seems it is going to last for a long time. Use before make up on my lips and under eyes for extra protection. (Not sure if I should) Easy to carry on my bag. Rated 5 out of 5 by Mrs3 from So easy to use, doesn't smell, doesnt make your face skin feel or look greasy, and giving good protection. Rated 5 out of 5 by akal from Will buy again Used for lips mainly. I have fair skin and burn easily, This worked really well for me. No funny taste or texture.